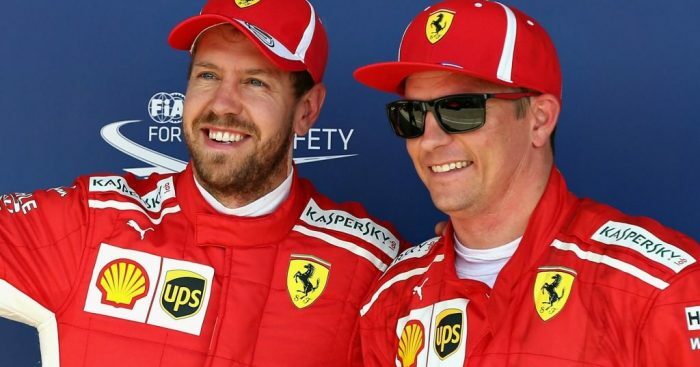 Sebastian Vettel has said he is “sad” to see Kimi Raikkonen leave Ferrari and described him as his greatest ever team-mate. Raikkonen and Charles Leclerc will be swapping seats at the end of the season, with the Finn returning to his first Formula 1 team on a two-year deal. Leclerc, meanwhile, has been promoted to the Scuderia after an impressive rookie campaign with Sauber in 2018. Vettel was asked for this thoughts on the big incoming change at Ferrari and said that the respect between himself and Raikkonen comes from the fact there has always been “zero bull****” between them. “Absolutely,” Vettel said when asked if Raikkonen has been his best team-mate. “Obviously one thing you can express in numbers and results and so on, but I think that’s not the most important thing. “I think the most important thing if you are teammates is the respect that you have for each other, or the degree of bull**** going on between each other, and with Kimi it has been zero from the start, and I don’t think it will change until the end. “Obviously it’s a great chance for Charles, but also it’s sad to know that Kimi is not there anymore because I think we get along even though we are different. Vettel said Leclerc’s arrival will change the dynamic of the Ferrari team but is happy that young drivers are able to progress through the ranks. He said: “Obviously it’s always a change, but to be honest right now nothing changes. So I’m more focused on the next races rather than next year. “Obviously it’s a great opportunity for him. He’s been in the junior programme of the team for a long time, so it’s good to see there’s progression. “I’m not thinking about that at all, so I have no thoughts. It’s always going to be different. Vettel said he has not caught up with Leclerc since Ferrari made the announcement, but there is plenty of time to do so. He added: “It’s correct. I don’t have his number, but in these days I’m sure he was very busy anyway.